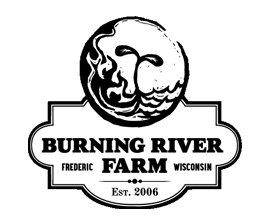 Thank you for visiting the Burning River Farm website. 2019 CSA Shares are now available! We have 2 ways for you to get vegetables from the farm. Do you want the best value and love to cook? Our traditional Box Share might be a good fit. Do you want choice and love going to the farmers market? Our Farmers Market Share might work well for you! Both options get you the freshest produce available with a focus on quality and flavor. We grow all of our produce with chemical free soil building methods. We wouldn't grow it any other way! Burning River Farm is located in Northwest Wisconsin, near the town of Frederic. Like most places, it has it's challenges when growing vegetables. But it also has hard to find qualities. The farm is located along the terminal moraine of the last ice age. Due to it's topography and shorelines, this area is not ideal for conventional agriculture and industry. This leave us with a high quality watershed, clean air and rich biodiversity. The farm is Certified Naturally Grown, the grassroots, farmer centric alternative to the USDA Organic label. Our fertility is compost and cover crop based. We use a generous crop rotation to improve the health of the produce and land. We grow produce you can feel good about! Seasonal positions for full time, part time and farmers market are available for 2019. If interested, please inquire.